Share a photo of you out enjoying your summer without using electricity with #PowerDownBC, and you could win. Submit a photo that shows us how you're saving energy by powering down your home and enjoying summer in B.C. How do you power down your home and enjoy the outdoors during the summer? 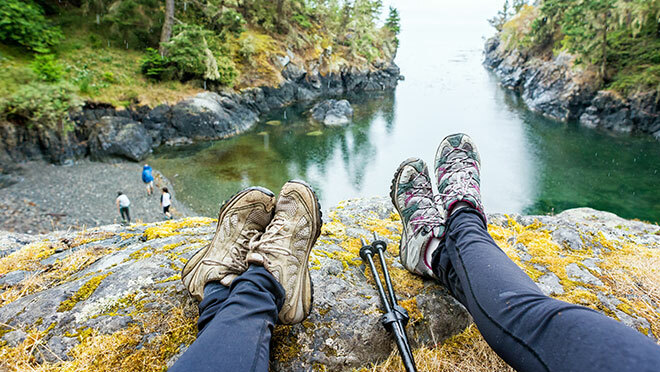 Do you like going on long hikes to enjoy our beautiful province, enjoy taking a refreshing dip in a lake, or do you enjoy curling up beneath a shady tree with a good book? There are lots of ways to enjoy the beautiful summer weather outdoors in B.C., and if you power down at home, you can save energy too. Show us your favourite way on Instagram or Twitter between July 17 and August 31, and you could win a grand prize package: a GoPro camera, Bose Bluetooth speaker and Sony wireless earphones. Plus, if you snap a photo at one of our recreation areas or visitor centres, enter our contest, and you could also win a Kobo eReader. Start by following us on Instagram (@bchydro) or Twitter (@bchydro). Choose your favourite photo that shows how you're getting outside this summer, and powering down to save electricity in your home. This can be cooling down by the lake, going on a hike, or taking your furry friend on a road trip. Use the hashtag #PowerDownBC on your Twitter or Instagram photo and include our handle @bchydro in your caption between July 15, 2017 and August 31, 2017 to instantly enter. Only one photo per person is eligible, so choose the best one that you've got, and ensure that the photo has been posted to your Instagram or Twitter within the contest period (i.e photos from previous months or years won't work unless you repost them). For privacy reasons, no selfies or photos that show faces can be submitted. If you're at one of our recreation areas or visitor centres, don't forget to tell us which one you're at. At the end of the contest period, a judging panel will select the grand prize winner from all the eligible entries. The grand prize consists of a GoPro camera and grip, Bose Splashproof Bluetooth Speaker, and Sony Wireless Headphones (approximate retail value $630). You also have the chance to win a Kobo eReader if you submit a photo from one of our recreation areas – we'll do an additional random draw just for those photos. See the full contest rules and regulations and eligibility. Photos should be of an activity that doesn't require a lot of electricity. Unplug and get outside to enjoy beautiful B.C., without cranking up the A/C and turning on the TV. A road trip, outdoor activities with your pets, swimming or hiking are all fun ideas for outdoor photos. We also encourage you to visit one of our recreation areas or visitor centres, and are even offering a chance to win an additional prize for those to make it out to one of our sites across the province. To protect personal privacy, photos featuring identifiable people are not eligible. Silhouetted figures or shots of people at angles that don't clearly show their faces (like the example above) are fine to submit. Stick to a photo that shows people from the back or side and avoid showing faces to ensure your photo will be eligible.